Unexpected glitz: London’s Bond Street | Oh, the Places We See . . .
Lighted boxes decorate Cartier for Christmas on London’s Bond Street. Sometimes we arrive at a hotel, put our things down, and head to the Concierge Lounge to get a bite to eat. And that’s what happened on a chilly December afternoon when we arrived at London’s Grosvenor House: A JW Marriott Hotel (a spectacular place to stay, by the way). But after a snack and quick drink, we were ready to see London, so we donned coats and boots and headed out the door, having no itinerary or idea what lay ahead of us. Hanging above Bond Street, these sparkling orbs marked the spot for Christmas finery. We were attracted by a sparkling orb dangling over a nearby intersection, so we turned down another side street not far from the hotel only to find ourselves in the middle of Bond Street where shoppers of means, no doubt, purchase goods for themselves or for gifts. 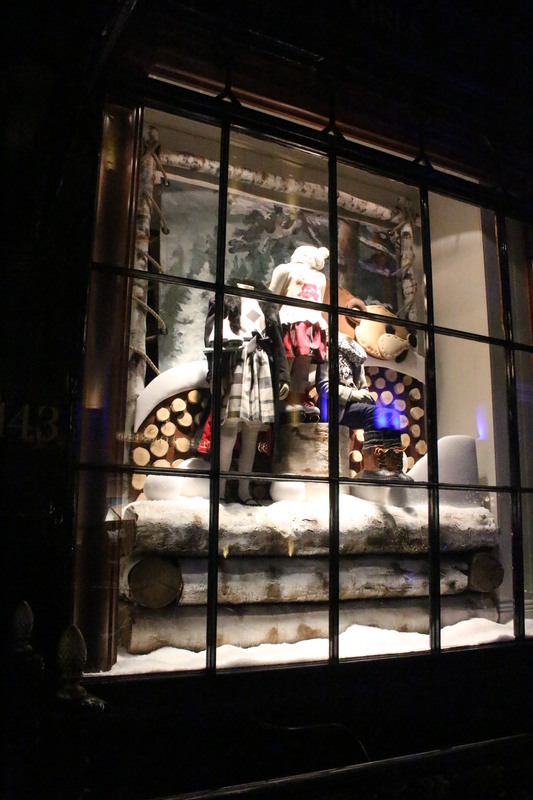 Shoppers on Bond Street — enjoying the lights and windows! A lone street musician added sounds of the season to our window shopping excursion on Bond Street. That night, however, shops were already closed, and those of us out for the evening found delight not in shopping but in peering into beautifully staged and lighted windows and soaking up sights and sounds. 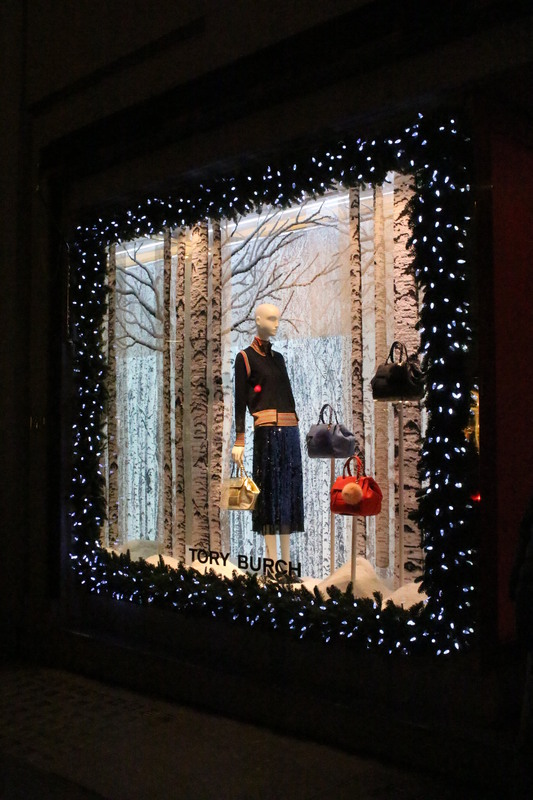 It was the Christmas in London we came to see — over-the-top designs, patterns, and accessories on one glitzy street. 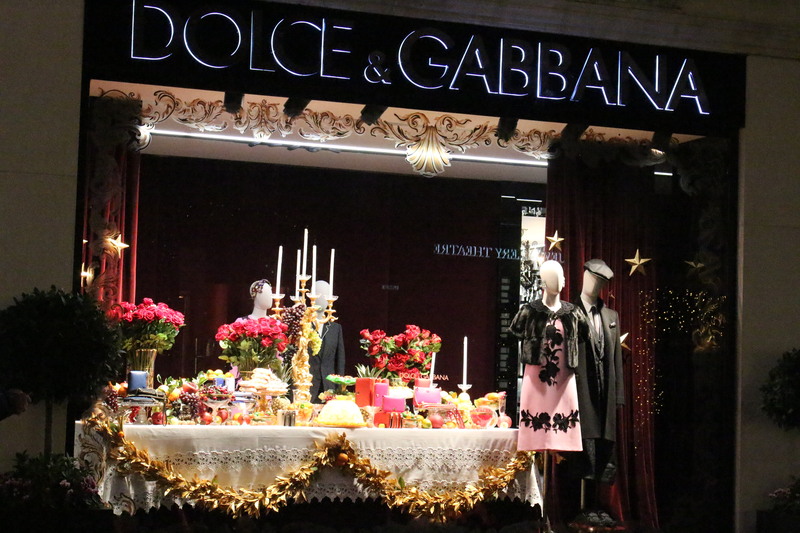 Sumptuous food filled the windows of Dolce & Gabbana. 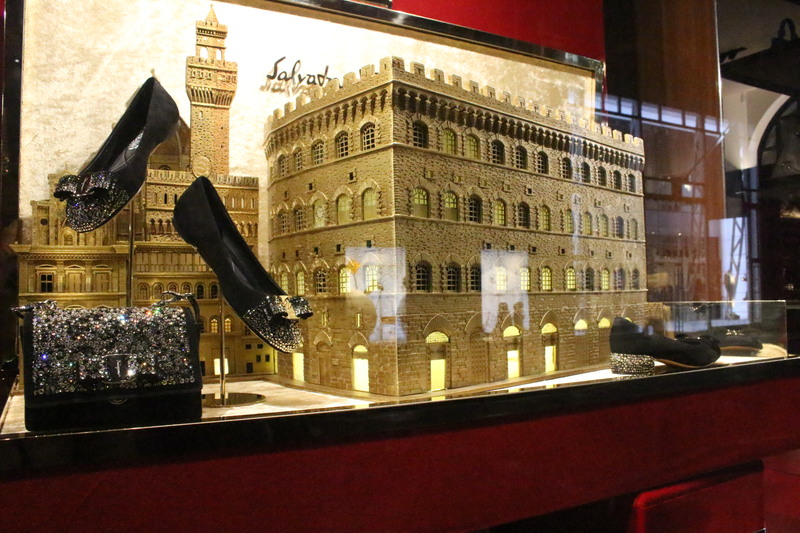 Glittery buildings formed the backdrop for Ferragamo shoes. A bit of a surprise — no winter clothes at Chanel. Resort wear, perhaps? 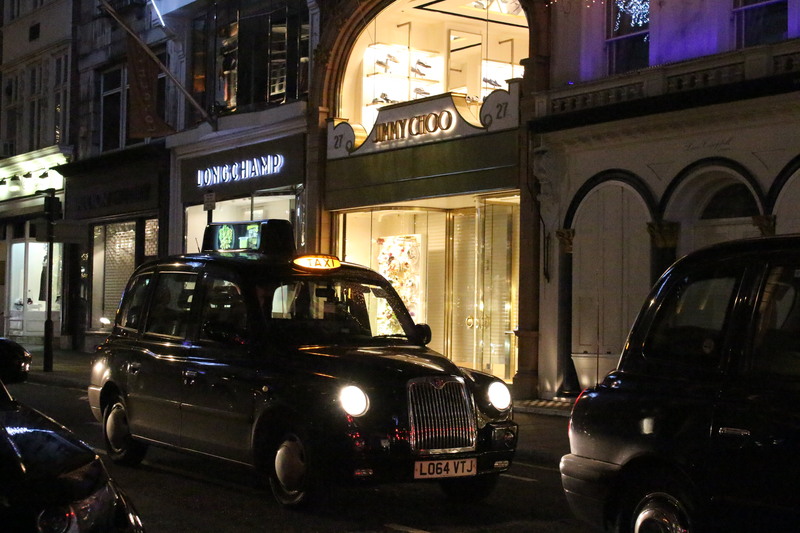 It wouldn’t be a trip to London without seeing those classic black cabs like this on in front of Jimmy Choo. 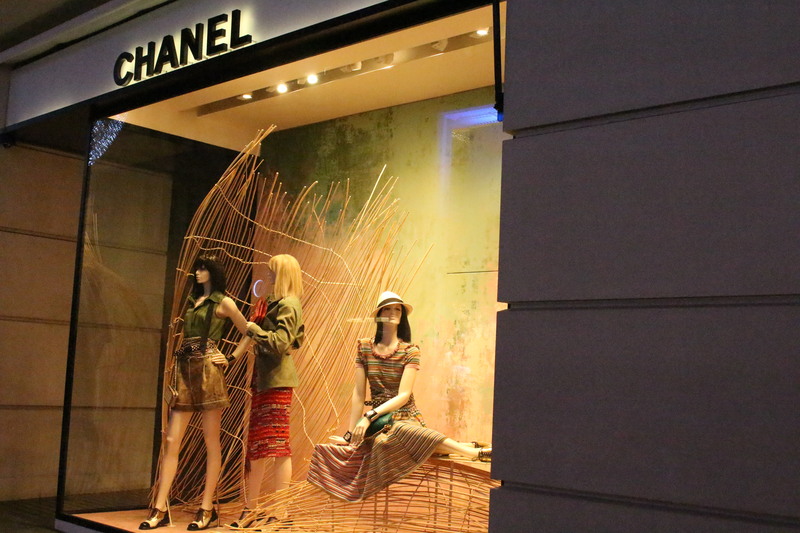 Although shops were closed (It must have been around 9:00 PM), Gucci stood out. Well lit inside and out, Gucci was astir with hush-hush conversations. We knew something was up. First, we noticed a Maserati parked near the door behind a black stretch limo. Across the street, men in dark glasses stood firmly on the corner — feet apart, arms folded, ever vigilant. Was someone special — rock star? actress? Londoner? — inside doing a little personal shopping after hours? Oh, how we wanted to know — but never did. Quite the stir at Gucci, the only shop open after hours on London’s Bond Street. A few city dwellers were out and about — window shopping, strolling babies or walking dogs. A lone delivery man pedaling for Deliveroo parked his bike and searched for the correct address. A Deliveroo box sits empty on the back of a bike — parked while the driver makes a delivery. But other than that, it was just another glamorous evening on Bond Street where white lights and glowing windows said Christmas — London style. What a find! 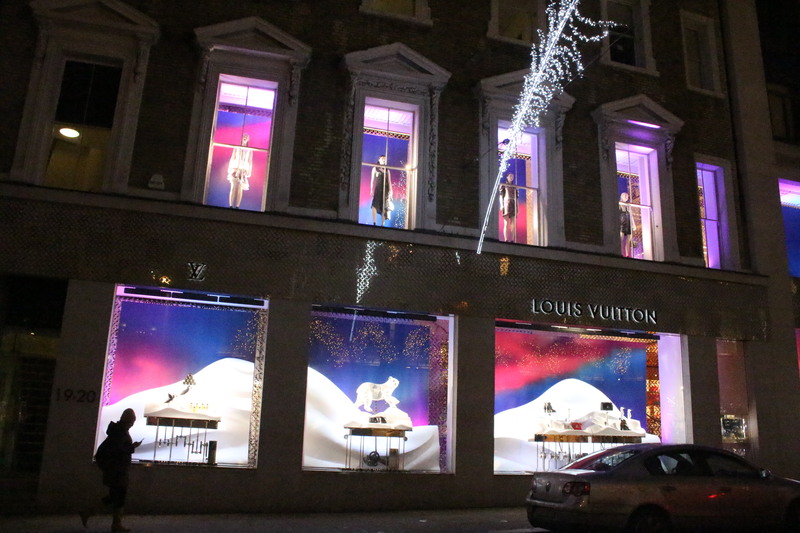 Programmed lights fanned out over and over again, bringing London’s Bond Street to life. 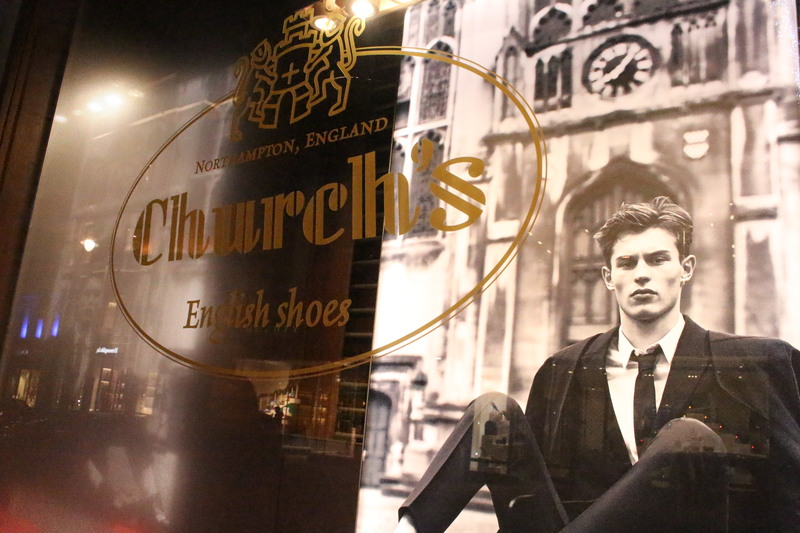 This entry was posted in England, Postcards from England: Christmas 2016, Travel and tagged Bond Street, Cartier, Deliveroo, Dolce & Gabbana, Grosvenor House, Gucci, London. Bookmark the permalink. I live in London but have never seen much of this – good inspiration! Thanks! We love wandering streets of any town, but London has some magical scenery around Christmas. Ailsa, I’m not sure why I missed this comment when you first posted. I was addled during the holidays, and just now sorting out a lot of things. Thanks for always being so prompt with your Travel Theme challenges. You’re such a good blogger with great ideas. Best wishes for a wonderful 2017! I love to window shop – and find great ideas for ways to use what I already have! Don’t you think those fashions look exactly like what we would expect in London!!! Loved all of them. And Happy New Year to you and Peggy. One of my New Year’s resolutions is to catch up on my blog reading! And yours are at the top of the list! Can’t wait to see what your next topics will be. How fortunate for you to have lived and worked in London, a truly international city. We love the excitement of it and the variety in buildings, people, clothing, etc. So much to see and take in. I guess that’s why it was fun to be out at night when almost no one else was just doing a little window shopping. Best wishes to you for a wonderful 2017!!! What a fun post. It just looks SO very different from the Christmas we had here on the tropical island of Sri Lanka on a road trip. That is what I love… the very contrast from one extreme to another. Bond street looks just amazing. I love contrasts, too. Sometimes we head to the beach during December just for warmer weather, and the decorations for Christmas are totally different from where we live in Tennessee. I’ve never been to Sri Lanka, but I can only imagine how different life would be. Best wishes for great adventures in 2017! It was sooooo good! We’d love to return — glitz or not. So much to see there. Thanks for your support. And best wishes for a great 2017! Hey R & B – I did enjoy this very much so. 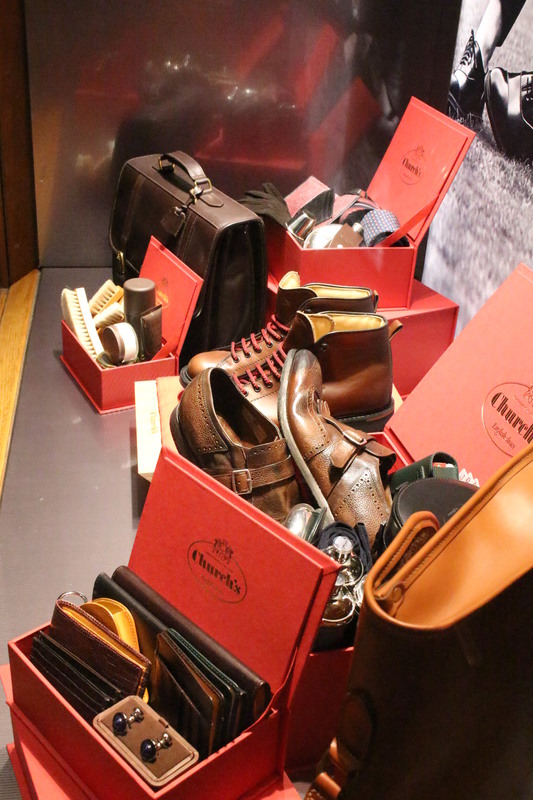 I actually stopped and paused to go slow – thanks for bringing us to bond street with you! Enjoyed the lights and beauty…. Thanks for your comments. We, too, were fascinated not only by what fashions were selected but also how they were presented. London’s a magical place — would love a return trip!